In late March of 2005, Micropolis Embassy Yahoo group member Jo Parzych posted a link to some images from the portfolio of Italian artist Guido Guidi. 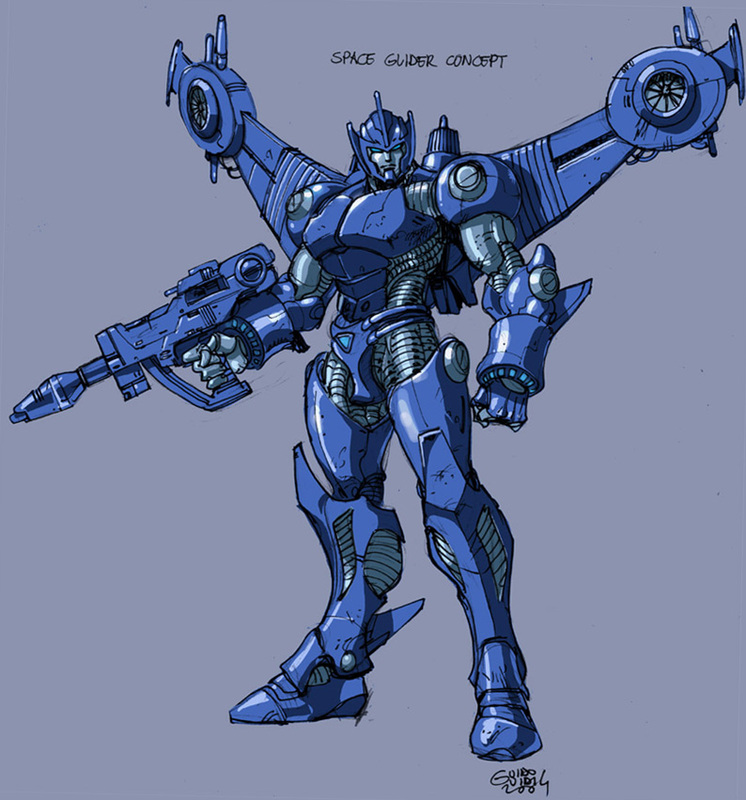 Guido is better known for his recent works on Dreamwave Production's Transformers Armada and Transformers Energon comics, but it was 2 distinctive illustrations that got the group buzzing. 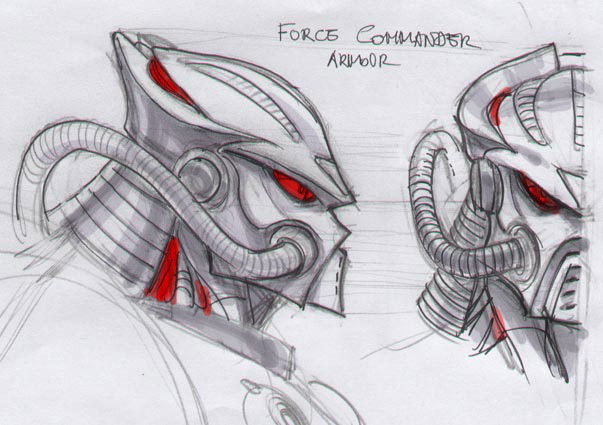 One was for a fantastically re-designed and updated Baron Karza, and the other for a more anime inspired yet graphic battle scene of Red Falcon standing over a severely wounded Force Commander. With Micronauts and all things relating to the Micronauts world and artwork being well known within the group, this stunning artistic revelation was quite a shock and pleasure to behold. 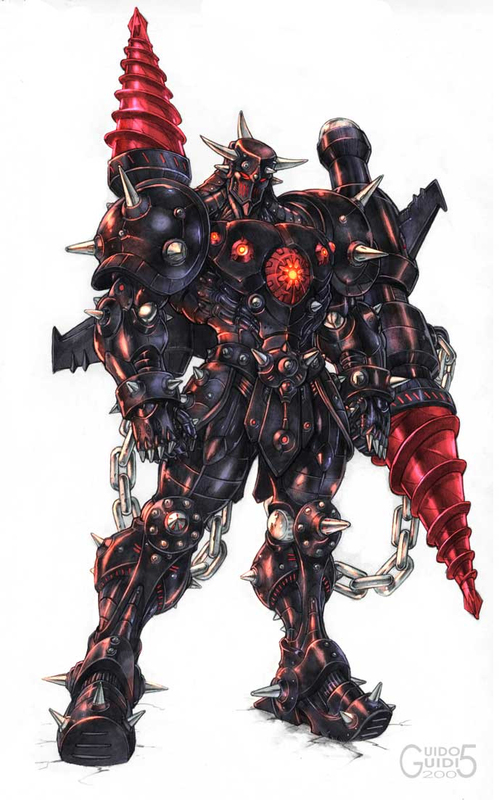 AcroRay: "The pieces shown on your website are of "Magno-Power" characters. I've been told how popular this particular series of Micronauts toys has been in Italy. Did this popularity have an affect on your choice of characters for the artwork?" Guido Guidi: "You're quite correct. The Magno figures were (and still are) very popular among collectors over here. Nobody gets it wrong when you talk about those white and black "robots" with magnetic joints! " AR: "How do you feel about those toys, and the other Micronauts toys? What were your childhood experiences with them, and what recent experiences have you had with the toys?" GG: "Again, I'm very attached to the Micronauts Magno figures. When I was a kid in the early-to-mid 1980s the Micronauts were one the most-desired toys... and they were very affordable too (unlike the Diaclone and later Transformers toys). I clearly remember my brother and I receiving a set of King Atlas and Green Baron with respective "horses". Those two were our favorites. 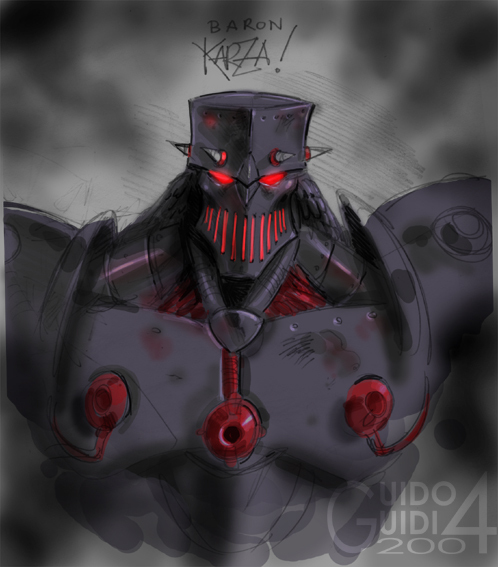 My first one was Force Commander, then Oberon, and I got Baron Karza only when I was 20 years old in 1993!" AR: "You noted that the Micronaut pieces seen on your website were a pitch for a new Micronauts mini-series. Were these directed at Devil's Due? Did you get with any feedback, and if so - what did they say? What would have been the idea for your mini-series?" GG: "Yes, I did those following an input from Devil's Due artist Stefano Caselli, who wanted to pitch the idea of reviving the comics. We discussed a few ideas. Most of them were about restarting the continuity from scratch for new generations. I'm sure most of the die-hard fans would have been rather upset about what we wanted to do! For example - we would have liked to have the Magno figures as main bad guys (among them Red Falcon, King Atlas, Green Baron) and only one with the good guys (Force Commander). Also they wouldn't have been mini-sized at all when visiting our world. Unfortunately, even if someone liked our ideas the project didn't get a green light, and stopped at the early concept stage... maybe because they already had other plans, really I don't know." AR: "Can you tell us about the pieces you've shown, what thoughts and ideas went into them? What influenced your interpretations of the designs? I notice that your versions of these Micronauts look very much like the Japanese "Super Robots" style, of which JEEG [the character toy that provided the Magno-Micronauts base design] was originally a part. 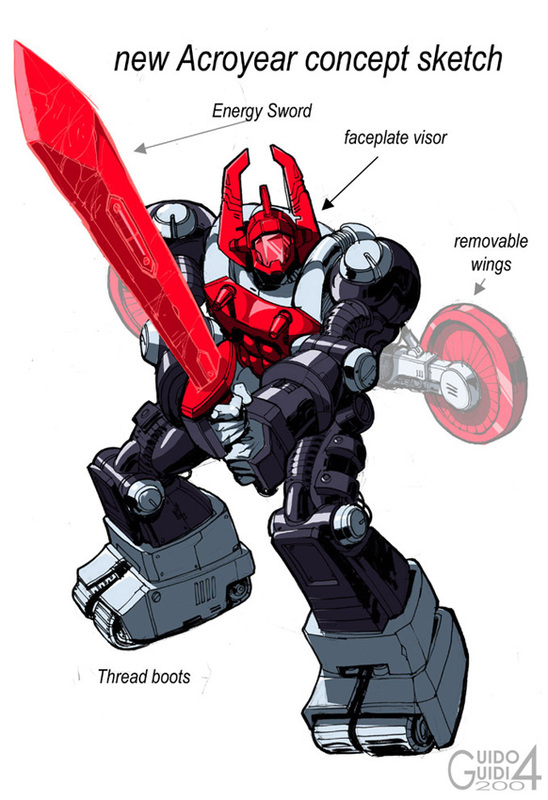 This is an element of the toys' design that many current interpretations of them have moved away from, as most North American collectors are unaware the Magnos' super robot origins." GG: "Indeed, you're right. Jeeg (like the other Go Nagai characters) is still popular in Italy. To most of the Italian audience Micronauts were just another series of Japanese robots - hence my take on those designs. 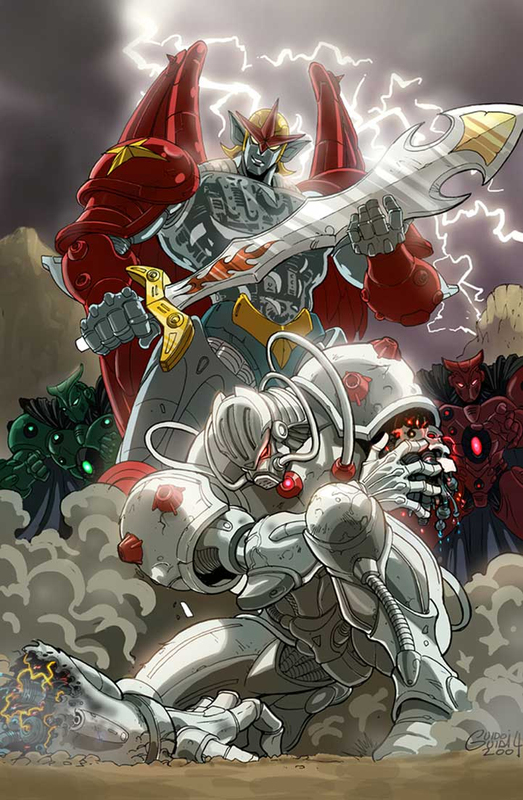 I'm a huge fan of Go Nagai's 1970s robot series (I was raised with Mazinger and Grendizer) and I wanted to make them more technological - more than just men in suits... to think of them as biomechanical beings. Also with all my experience in the Transformers field it was natural to redraw them in a more hi-tech and anime-styled version! When I had the opportunity to read some Micronauts comics, I was really surprised to find that they weren't intended as robots or cyborgs, and that actually they were micro-beings!" 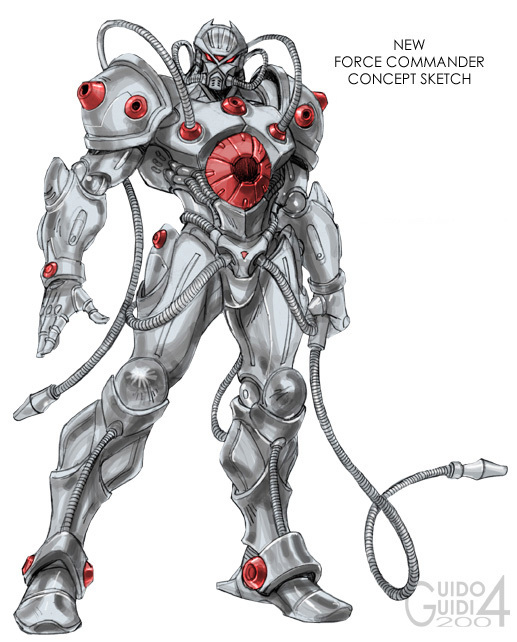 AR:"Have you approached Kinetic Comics/Toys with any Micronauts ideas? Have you mentioned Micronauts to any of your contacts at Hasbro? If so, have any of these companies made any comments about them? Do you have any hopes or thoughts about the Micronauts property today?" GG: "So far I haven't had any comments or contacts about Micronauts with those companies. Anyways, after seeing the new great action figures from SOTA Toys (I'm especially impressed with Lobros!) I think the future should be bright! I think such designs could perfectly suit a live action movie, and I just hope that if whatever media will come out from the new series (comics, cartoon or video games) it will use all their potential. For example, it would be really cool to have a video game where you can actually use their interchangeable features in combat! As for Hasbro, I think they are already busy enough with their Transformers lines. But it's cool to think the Transformer and Micronauts basically are like "brothers", as both originated by Microman (+ Diaclone for TF)." AR: "Any other comments on your Micronaut images?" GG: "Sure! Check those other sketches I did back on September 2004 and that I had posted on my website for some time. 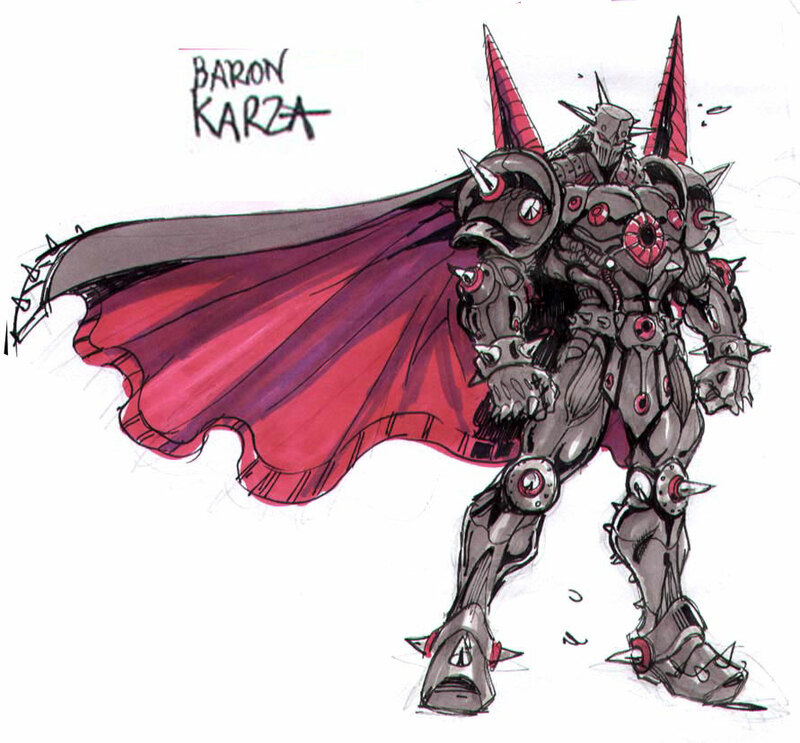 I've also included the preliminary sketch for that Baron Karza illustration. If I had the time I would have liked to do the same for the others characters. But with those amazing new official designs upcoming, it didn't make much sense." AR: "Thank you so much, Guido Guidi, for sharing your Micronauts images and experience with us at the Micropolis Embassy! 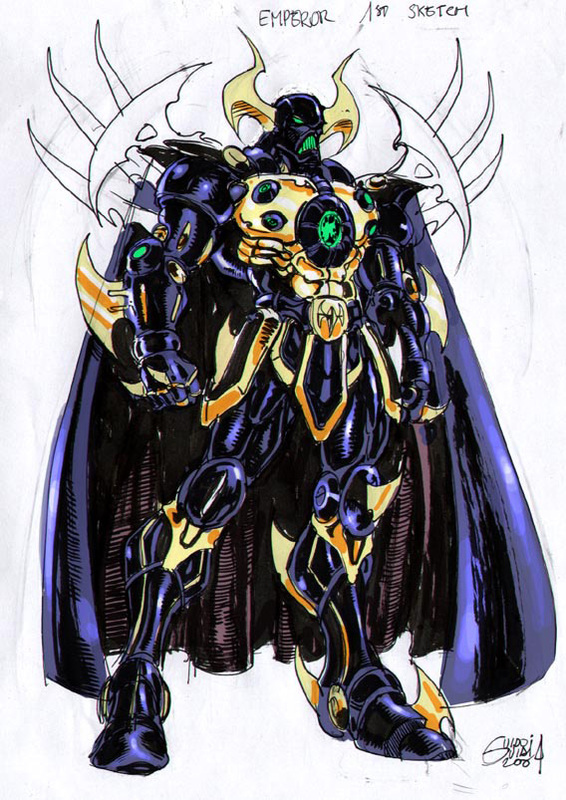 Personally, I hope that someday these designs may someday be applied to plastic and diecast metal, because as a longtime fan of the Japanese robot & mecha genres I really like your interpretations!" Many thanks to Ray Miller and especially Guido Guidi for sharing this interview and artwork with ISO. All images copyright © 2004/5 Guido Guidi and ISO respectively.